VIP-courses may focus on farming, cultivation and raw material logistics as well as quality control, HACCP and marketing. 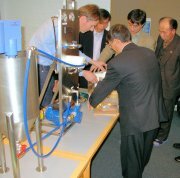 Excursions reveal how technique and procedures are applied in a modern starch industry. Couching factory operators will teach them how to operate the factory from the Operation Control Centre (OPC), maintenance and quality procedures. Long term training on site may accomplished with a training package for an extended period of time. Together with Danish DANIDA we have carried out such extensive training program over a three year period. Supported partnerships under the Private Sector Development Programme are available in several countries. Compared to a technical advisor a training package comprises several teachers and each teacher being a specialist within his field. A training package comprises several distinct courses with well defined targets and follows a strict time schedule. For example a HACCP (Hazard Analysis Critical Control Point) Quality Management course may eventually qualify for development and implementation of HACCP-quality management systems. Other courses may target implementation of analytical methods adapted to customer demands; hygiene and sanitation and of coarse product manufacturing from field cultivation to end product. Each course tailored to the training needs of the staff. More about advisory services.